What Children’s Books Totally Creep You Out? We have many, many different kinds of books in my daughter’s home library. Funny books, beautiful books, repetitive books, moralizing books, movie tie-in books, over-her-head books – even though most of those books are either picture books or early readers, just within those two formats, there are so many different subtle variations and sub-categories that it boggles the mind. But, there is one category, perhaps more than any other, which remains constantly on my radar, particularly at bedtime. Those are the books that my daughter absolutely loves, but that totally and completely creep me out. Last week, Time Magazine critic and author Lev Grossman wrote a great article titled “Hating Ms. Maisy: The Joy, Sorrow and Neurotic Rage of Reading to Your Children” that should resonate with any parent who’s had to suffer through their fiftieth straight bedtime reading of their child’s favorite Berenstain Bear or Magic Tree House book. (BTW, Grossman’s novel The Magicians is definitely on my “Books My Kid Will Read in the Future” list.) Grossman talks about the unhealthy relationship that starts to develop between a parent and a bedtime book that’s fallen into heavy rotation – in his words: “The fact that my children’s taste is not my own, while obvious, is one I’ve found strangely hard to accept” – and I know exactly what he’s talking about. I find Raymond Briggs’ The Snowman creepy beyond belief—that snowman reminds me of the frightful Other Mother in Neil Gaiman’s Coraline. The way he tries on the boy’s sleeping parents’ clothing… you can see he’s thinking about doing away with them, right then and there, with his bare, blobby snow-hands. And she does. 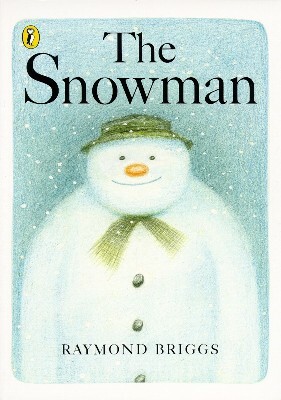 The Snowman might be one of our most frequently read bedtime books of all time. I’ve had magical experiences reading my daughter The Snowman after a long day playing out in the cold and building our own snowman. 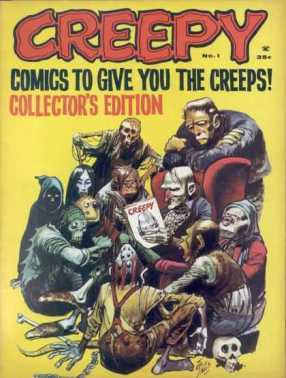 But, despite my family’s reverence for the book, I completely see where Grossman is coming from. OK, Bobby, get the bungie cords and ball gags. Let’s show your parents what happens when they send you to bed without dessert. And why can I see Grossman’s point so easily? Because I have my own list of books from my daughter’s home library that weird me out to my very core. 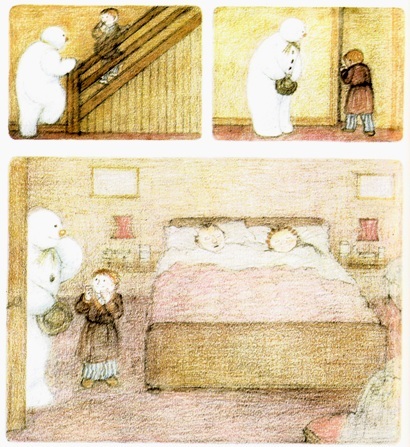 Case in point – another one of Raymond Briggs’ picture books – The Bear. The Bear is a gorgeous, large-format picture book in which a young English girl, who’s cuddling with her teddy bear one night, wakes up to find a huge polar bear in her room. She manhandles the bear into bed with her and, in the morning, she tells her parents about the new house guest. The parents quickly dismiss the bear as an imaginary friend and the girl spends the day trying to manage having this enormous animal in her house. She has to feed the bear, wash the bear, clean up after the bear – it’s quite an ordeal. 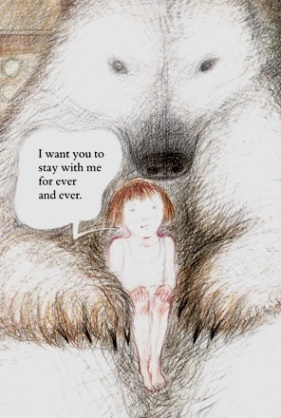 Briggs is an amazing illustrator and there are some wonderfully tender moments in The Bear, but there are also these odd moments where the little girl starts ranting and raving about The Bear and… I’ll admit, they creep me out. And I’m aware that, like Grossman said, I am probably bringing my own “neuroses and secret fears” to the text, but, when the girl starts in on these monologues and I have to read them aloud to my daughter, I find myself adopting the tone and cadence of a serial killer or, at the very least, of a demonically-possessed kewpie doll that’s preparing to slaughter a suburban London family. she finds out how big you are. all over the house, she’ll never let you stay. or they might put you out. Will you pay attention when I’m talking to you! He’s so big and quiet, Mummy. except when he cuddles me. 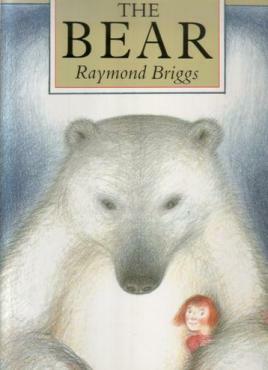 Now, please, Raymond Briggs fans, I do understand that I am being fantastically unfair to The Bear at the moment. The fact that, when I read this little girl’s voice aloud, I immediately fall into a Village of the Damned/Bad Seed/Whatever Happened to Baby Jane voice is my own damn fault. That’s me bringing my own baggage to the text. But, regardless, the book still inspires that reaction when I read it, so there is something deep in the animal centers of my brain that is simply creeped out by what I’m reading in The Bear. How can such a common baby shower present make me so damn uncomfortable? Again, I know that’s a subjective and perhaps unfair reading of the text. 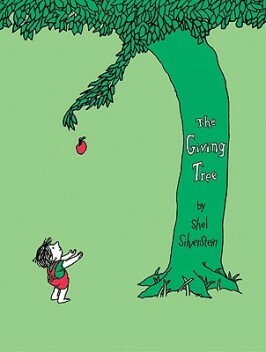 I KNOW there are better and more thoughtful ways to interpret the meanings of The Giving Tree. But my first instinctive reaction while reading it is to flinch, like I’m watching someone get punched in the face. And that unnerves me down to my soul. Am I alone in this? Does anyone else have a children’s book that really creeps them out? A book that they hide in the back of their bookshelf in hopes that their kid forgets that it exists? And I didn’t even mention the sheer awfulness of the way C.S. Lewis treats Susan at the end of The Last Battle, the final chapter of the Narnia series. If you have a kids’ book that unnaturally creeps you out, even though your child loves it, share it in the comments section below. Perhaps it can serve as a warning to other parents or, at the very least, maybe others will validate your deep and unnatural fear of Little Critter. I know Heather but it still gives me the heebie-jeebies. I guess I am just dead inside, lol. I agree with you about these above and also want to add “I’ll Love You Forever” by Munsch. Sure, it starts out innocently enough, with a mom rocking her sleeping child. Cute, right? But then the boy grows up and his mother sneaks into his apartment one night and rocks him as he sleeps. And if that isn’t stalker-ish enough, she calls him later with basically “I’m dying, why don’t you come sing to me?” I really, really hope that when my daughter is a grown adult I can separate my life from hers and not crawl through her bedroom window one night. I know it is supposed to be allegorical but I am sure you can teach your child unconditional love without it being creepy. Wow. And I only knew Munsch as the “Paper Bag Princess” guy. If “Love You Forever” is THAT monumentally creepy… I kind of want to read it now. You do know that he wrote “Love You Forever” after he and his wife lost two pregnancies? Makes the creepiness a little more understandable. I’m still never going to read it to my kids. The Rainbow Fish. I know it’s supposed to be about sharing but to me, the take away message is that you have to give away what makes yourself special and unique so that you will be accepted by jealous, petty others. So, what you’re saying is that The Rainbow Fish is the picture book equivalent of Grease? Oh, yeah. THe Giving Tree is totally in an abusive relationship. That always bothered me too. And now I must seek out this Bear book JUST SO I can read it in the creepy voice. Thanks! I’ve thought a lot about how Coraline is totally creepy and unsettling, but somehow (to me at least), The Graveyard Book is not. I don’t know. Kind of like Roald Dahl books. Some have a certain lingering ick factor, while some bring you through weirdness and somehow leave you feeling nice and warm and happy. Oh, Coraline is SUPER creepy, but I almost give it a pass because it’s TRYING to be creepy.